Focused attack of birch paired with rich lows that only bubinga delivers. This Tama Starclassic Performer B/B is an exclusive 4-piece drum shell pack that provides sweet and deep hybrid tone, exhibiting the focused attack of birch paired with the enhanced lows of bubinga. This Tama shell pack includes a 22 x 18" kick drum, 10" x 8" and 12" x 9" toms, and a 16" x 14" floor tom. The tom shells are 6mm thick with 4 outer plies of birch, and 3 inner plies of bubinga. The kick drum shell is 8mm thick with 5 outer plies of birch, and 3 inner plies of bubinga. The MTH909 slideable tom-holder gives you nearly limitless setting flexibility. 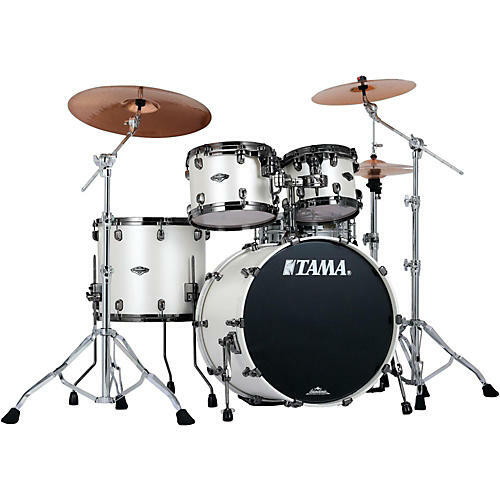 The Tama Star-Cast Mounting System has always provided maximum resonance and stability for Tama's pro drums. Now it has a more streamlined designed, making it easier to position tom drums closer together. In addition, a switch to aluminum provides lighter weight and even truer tonal vibration. Star-Cast is also now plated to match your drum's shell hardware. Tama Starclassic Performer's completely redesigned tom-holder expands setting flexibility with a sliding connector unit that moves back and forth up to 50mm (2 inches). Simply unloosening one bolt allows you to adjust the proximity of the tom toms. Now any sized drum can be exactly positioned with ease. Hoops not only affect drum tuning, they also affect drum sound. That's why the choice of hoops is so important to the designers of Tama's professional drum lines. For the Starclassic Performer B/B, Tama chose zinc die-cast hoops, which are manufactured by injecting molten metal into molds. Die-cast hoops have more density and are more consistent in shape than triple-flanged hoops, which are manufactured by bending metal plates. Die-cast hoops make tuning more consistent and easier to achieve because the tension bolts always contact the hoop properly. Drums fitted with die-cast hoops also offer crisper attack, clear and resonant highs, and much more powerful rim shots. Tama's MSB30 die-cast bass drum spur brackets hold the spur bracket securely, thanks to the same powerful hinge mechanism used on the MTB30 mounting bracket. Unique memory markers found on the folding spur bracket help simplify set up. Starclassic's Air Pocket rubber feet feature a special air chamber, that eliminates the transfer of vibrations to the floor (which chokes sustain and sound) and absorbs shock for better playing. Evans drum heads are featured on all Tama Starclassic Performer drums (except bass drum front heads). On the rack and floor toms, Genera G2 2-ply clear batter heads and Genera G1 1-ply clear bottom heads provide both durability and solid sound. Starclassic bass drums are fitted with Genera EQ4 clear batter heads. Cymbals, snare and hardware not included. A winning combination of birch and bubinga. Order today.